Baby Update No. 3: It’s the Final Countdown! 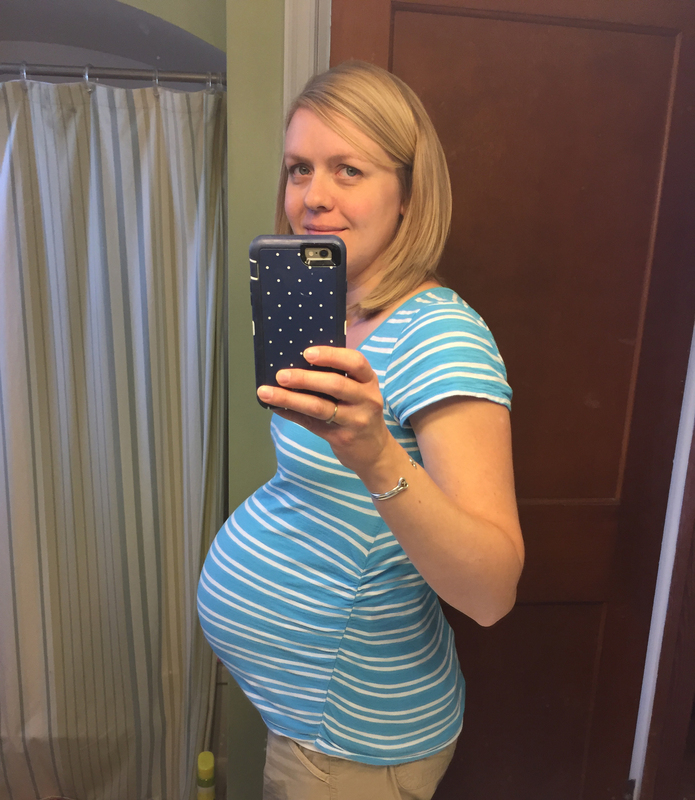 36 weeks of my pregnancy went off without a hitch. I’ve told many people that this has by far been my easiest pregnancy. If you know my story, you know that’s miraculous! Because of past difficulties in pregnancy, I was urged not to have any more children, and we had planned to follow that advice. But God had other plans. So for 36 weeks I’ve been amazed at his kindness and generosity towards me, in giving me a third child that I desperately wanted, and in giving it to me with such ease. On Friday everything changed. I discovered some concerning red blotchy patches on my legs. There was no explanation for the blotches, such as skin irritation or injury. And because of my history, I have a heightened awareness for things like blood clots. My anxiety was only intensified by the realization that I had stopped my aspirin regimen about 10 days prior to the appearance of the blotches. There had been just enough time for the blood thinning aspirin to leave my system before these blotches appeared. I called my doctor and was sent for an ultrasound of my leg at the hospital to check for clots. The scan was clear — praise God! But I was still terrified! I hadn’t been seen by a doctor at the hospital, nor had my doctor seen me. I was relying only on the word of a kind ultrasound tech that I was going to be just fine. The timing of this instances did not escape me. I was headed to a women’s conference at my church Friday night and Saturday. And I could keenly perceive that the enemy wanted to steal my weekend intended for refreshment. As I battled my anxieties on Friday, the verse that came to my mind was John 10:10: “The thief comes only to steal, kill, and destroy; I have come that they may have life, and have it to the full.” Ironically, this ended up being one of the keynote speaker’s main points — abundant life. I knew that the enemy of my soul was trying to rob me through these fears. But man was I terrified! As I sat under the magnificent teaching of Priscilla Shirer, I listened to her teach about a God who is more than ABLE to do way beyond what we could ever imagine (Ephesians 3:20-21). And the whole time I’m thinking about my blood clotting in my legs. And I’m thinking, “sure, God is able, but I’ve lived long enough to know that doesn’t always mean he’s going to. What do you have to say about that Priscilla?” And wouldn’t you know, she answered my unspoken question. She said she received a question which was essentially what I was asking in my head, “I struggle with serving a God who CAN, but WON’T.” I know there are times when God simply chooses not to do what it is that we want him to do. And I should have known because there was fear rising up in that question that it was sent to my mind by the enemy of my soul. Maybe I did even know that. But I listened for Priscilla’s answer. “It’s really about trust,” she said. “Do you trust God, or don’t you?” Well, I guess that does get to the heart of it. Did I trust that even if God said no and any of my worst fears came true, did I trust that he was good, and that he was enough? It has taken me more time than I’d like to admit to answer these questions. I battled with these questions all weekend. But as his Spirit ministered to my soul, I found again, as I have before, that he is completely trustworthy. Whatever his answers may be to the end of this pregnancy, I trust in his goodness. That is a little easier to say after seeing my doctor this morning! But I promise the choice to trust came before my doctor’s appointment. It came with each breath, with each time I closed my eyes to sleep, with each moment I looked at my sweet children and loved them, with each time I glimpsed and loved my husband. My life is so blessed and so precious. It feels like a lot to trust God with! But back to the doctor’s appointment — My blood pressure remains the lowest it’s ever been during any pregnancy of mine (and really low even for a non-pregnant person). My weight gain continues to remain very low. And my blotches, whatever they are, appear to be surface level. While they “look strange,” according to the doctor, they didn’t “feel concerning.” I’m very thankful for a good report! I will continue to be cautious and to watch my leg, but there is no reason for worry right now. Through this ordeal this whole weekend, God has continually spoken to me the words of Philippians 1:6: “being confident of this, that he who began a good work in you will carry it on to completion until the day of Christ Jesus.” We definitely consider this pregnancy something that God began in me as it was not of our own planning. Before I even was surprised with this pregnancy, God spoke to me through another Old Testament Bible story about my dream of having more children, which I thought at the time was not to be. After hearing from him in that story, the surprise was less of a surprise to me, but that’s another story for after the baby is born…. when he completes this good work that he began! Thanks to all who have prayed with me and for me and encouraged me through this pregnancy, and especially the last few days. I am so blessed to have so many wonderful friends standing with me! One Response to Baby Update No. 3: It’s the Final Countdown!